Hello friends! Spring is in the air – the trees are starting to bloom here, it’s nice and sunny outdoors and I can’t help but feel inspired! 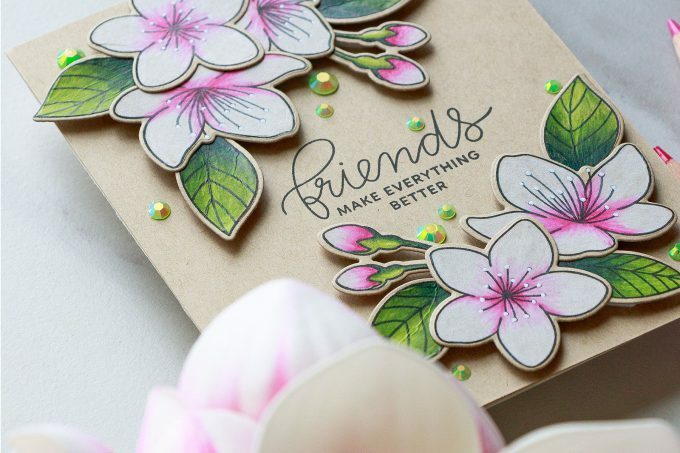 I have a Cherry Blossoms card to share made using some time ago using stamps from Pretty Pink Posh. There’s also a photo tutorial at the bottom of this post if you’d like to see this card done step by step. 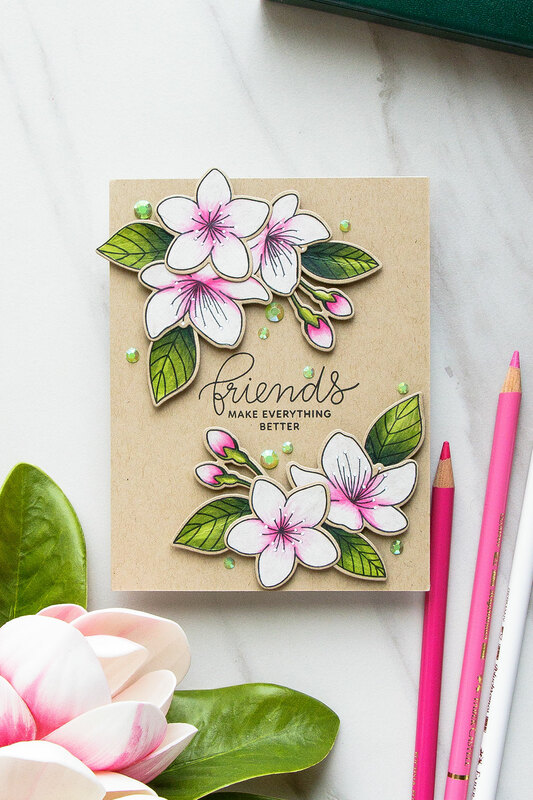 I started working on this card by stamping images from the Cherry Blossoms stamp set by Pretty Pink Posh onto kraft cardstock in black ink with the help of my mini MISTI. You’ll need to use a stamping tool such as MISTI for this tutorial. Keep stamps in the tool and do not reposition them – you’ll need to re-stamp same images (black outlines) once you are done coloring. Next, I used my Polychromos pencils and colored each bloom, flower bud and leaf. I love to use my Polychromos pencils more than Prismacolors because they are harder and that means I can sharpen them to a finer point without braking the tip of the pencil. Since I often color small images it’s important to have a finely-sharpened pencil to be able to work on little details. #170 May Green, #168 Earth Green Yellowish, #278 Chrome Oxide Green. Once my coloring was done I cut images out with the help of coordinating dies, stamped a beautiful sentiment and arranged the flowers into corner clusters framing the sentiment. Lastly, I added several jewels for finish the card off. I have step by step photos of how this card came about. Click to enlarge and as always – feel free to pin to Pinterest and save for later! Stamp images from the Cherry Blossom set onto kraft paper in black ink using your mini MISTI. Keep stamps in the MISTI as you’ll need to re-stamp them again once you finish coloring. I stamped same images twice. Grab your favorite colored pencils and start coloring! I used Polychromos pencils from Faber Castell. 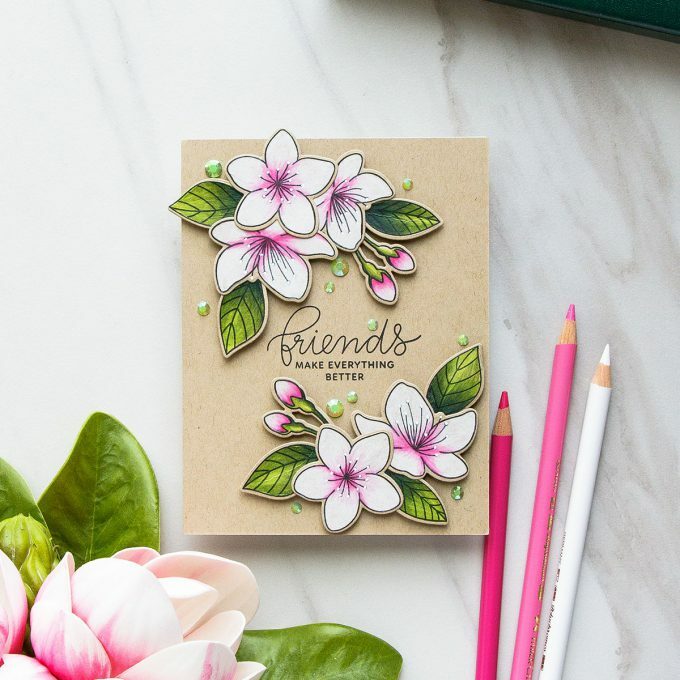 You’ll need a white and 2 pink pencils to color flowers. With a light hand lay down a layer of white. Add dark pink and blend the colors out using white. Add more color if needed. Mark your highlight with a white pencil. Color stem using lightest green. Add shadow using medium and dark green. Use same approach to color the rest of the flowers. Keep petals mostly white and color centers pink. Place panel back into the MISTI and re-stamp black outline. Group flowers into clusters and foam mount onto a kraft cardstock panel. 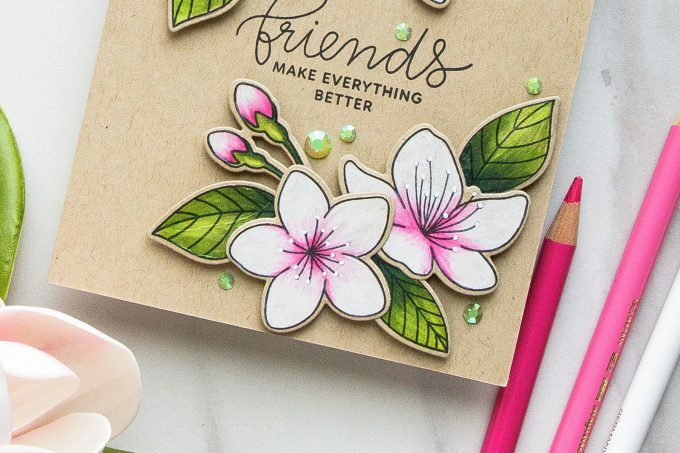 Stamp sentiment in black ink and embellish using our new jewel embellishments. Such a beautiful card with awesome coloring!! So gorgeous…you have made me bring out my pencils again!! 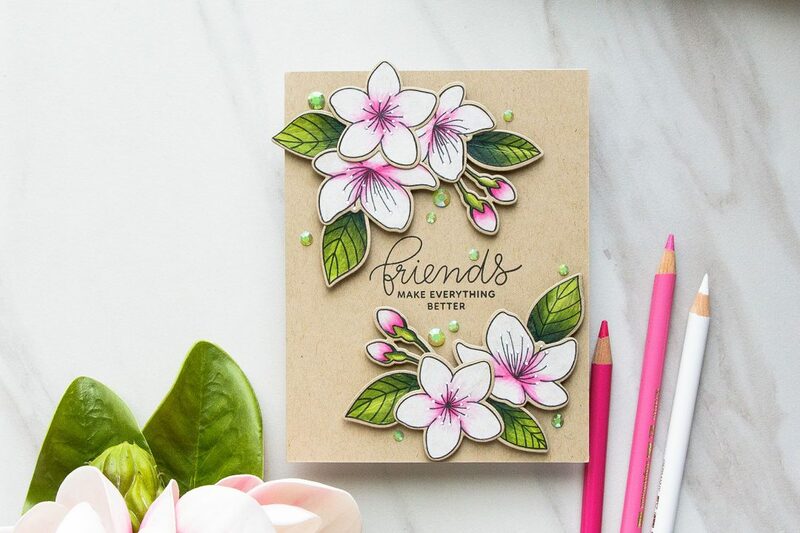 Love your coloring and the beautiful card.